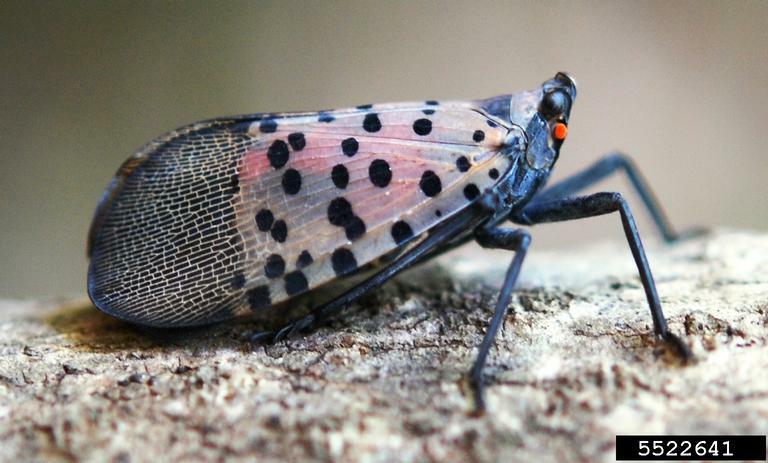 The spotted lanternfly, an invasive planthopper, was first discovered in the United States in Pennsylvania in the fall of 2014. It is native to China, India, Vietnam, and introduced to Korea where it has become a major pest. This insect has the potential to greatly impact the grape, hops and logging industries. In November of 2017 a single female was found in New Castle County Delaware. During that same month, a dead adult was also in Delaware County, New York. Since it poses a very serious threat, people are being urged to look for and report any finds in both states where the pest is known to be, and where it has not yet been detected. The insect is currently in the egg mass stage. New egg masses that were laid in the fall have a grey mud-like covering which can take on a dry cracked appearance over time. The spotted lanterfly egg mass in the photo below is laid near a gypsy moth egg mass, another non-native invasive species. Egg masses can be laid on any flat surface including trees as shown below. Old egg masses appear as rows of 30-50 brownish seed-like deposits in 4-7 columns, roughly an inch long. The immature stages are black with white spots, and develop red patches as they grow. The spotted lanternfly adult is approximately 1" long and 1/2" wide at rest. The forewing is grey with black spots and the wings tips are reticulated black blocks outlined in grey. The hind wings have contrasting patches of red and black with a white band. The legs and head are black; the abdomen is yellow with broad black bands. Trees, such as tree-of-heaven and willow, will develop weeping wounds from the feeding damage of this pest. This sap will attract other insects to feed, notably wasps and ants. If you suspect that you have found the spotted lanternfly in Ohio, please contact the Ohio Department of Agriculture at (614) 728-6270.